Rebounding from a last-place finish in the Travers Stakes, Kaleem Shah’s Bayern once again displayed his formidable front-runner prowess as he vanquished Kentucky Derby and Preakness Stakes winner California Chrome and a standout field Saturday to win the Grade 2, $1 million Pennsylvania Derby for 3-year-olds at Parx Racing. Bayern’s eye-catching victory — in some ways mirroring his blitz to victory in the Grade 1 Haskell Invitational at Monmouth in July — capped a day in which, one race earlier, sophomore filly divisional leader Untapable also delivered the goods, taking the Grade 1, $1 million Cotillion by a length over late-running Sweet Reason. Still, the day belonged to Bayern. Ridden by Martin Garcia for Hall of Fame trainer Bob Baffert, Bayern bounced out to a two-length lead through an opening quarter-mile in 24.07 seconds and maintained his advantage the entire way around before opening up in the stretch to win by 5 ¾ lengths over runner-up Tapiture. In victory, Bayern set a Parx Racing track record, completing the 1 1/8-mile dirt race in 1:46.96 seconds before a crowd of more than 16,000. The all-source handle of $10,396,671 on the 13-race card smashed the all-time record of $5,519,897 set last year on Pennsylvania Derby Day by 88 percent. Baffert, who watched the race at home in California, was elated. California Chrome, making his first start since being denied the Triple Crown when fourth in the Belmont Stakes, broke sharply and was taken back to race in third in tight quarters going into the first turn. After riding the rail and stalking the pace, Jockey Victor Espinoza asked his colt to rally in the stretch, but California Chrome failed to respond and was eased in the final sixteenth of a mile, finishing sixth in the field of eight. G2 Pennsylvania Derby — Bayern, trained by Bob Baffert for Kaleem Shah, Inc.
As the 3-1 second choice, Bayern paid $9 for a $2 win bet. The $562,000 winner’s purse increased the colt’s lifetime earnings to $1,639,680 in nine starts. Shah and Baffert each collected $50,000 bonuses that Parx awarded to the connections of Pennsylvania Derby horses that had won the Kentucky Derby, Preakness Stakes, Belmont Stakes, Haskell Invitational or Travers. Sherman and California Chrome’s owners Perry Martin and Steve Coburn, received $100,000 bonuses for having won the Kentucky Derby and Preakness. One race earlier, Untapable’s grit was the story. The filly, who had finished well in arrears of Bayern in the Haskell, rediscovered her winning ways yesterday. Ridden by Rosie Napravnik and trained by Steve Asmussen for Winchell Thoroughbreds, the daughter of Tapit beat Sweet Reason by a length, with Jojo Warrior a length back in third, completing the 1 1/16-mile dirt race in 1:42.71 over a fast track. The victory was the third Grade 1 stakes of Untapable’s stellar season, with the only defeat suffered in her past six starts coming when she was fifth to Bayern and other males in her most recent start, the Haskell Invitational. “I was extremely pleased to have her back in the winner’s circle where we feel she belongs,” Asmussen said. “I think a lot of little things added up to [the Haskell defeat] not being her day. I was very proud that she came out of a tough race like that, tough circumstances, to win a Grade 1. Asmussen said Untapable would be flown to California on Sunday morning to prepare for the Breeders’ Cup Distaff. Jojo Warrior, trained by Bob Baffert, led the Cotillion through an opening quarter-mile in 23.49 seconds and a half in 46.62 while hounded by Cassatt. 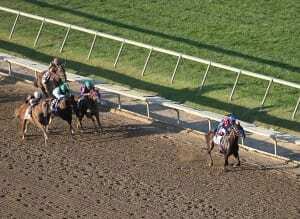 Napravnik kept Untapable reserved, off the rail and in the clear, stalking in third place. Nearing the quarter pole, Napravnik asked Untapable to move to the leaders and she attacked three wide, followed by Sweet Reason. 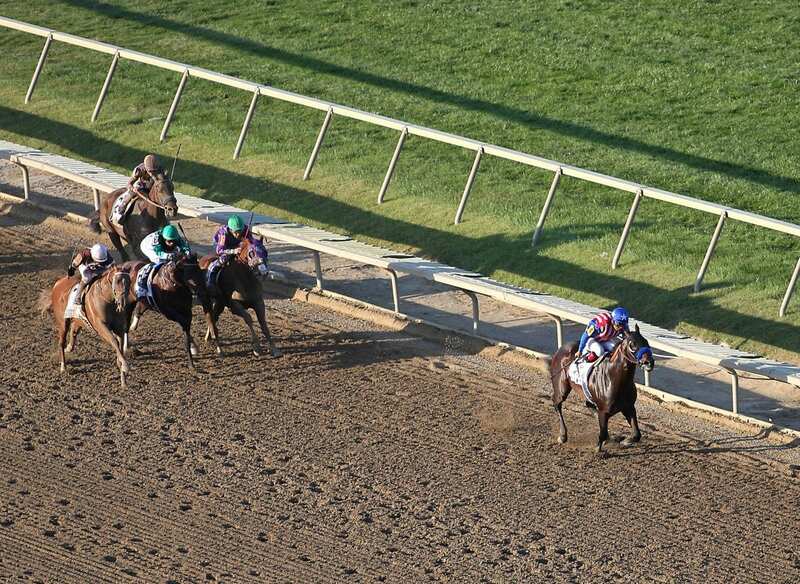 Cassatt gave way at the top of the stretch, while Jojo Warrior dug in on the inside, but Untapable proved best. Little Alexis finished fourth followed by Cassatt, Joint Return, Vero Amore and House Rules. Untapable paid $3 for a $2 win wager as the 1-2 favorite. The $562,000 winner’s purse increased her lifetime earnings to $1,896,725 in 10 starts.